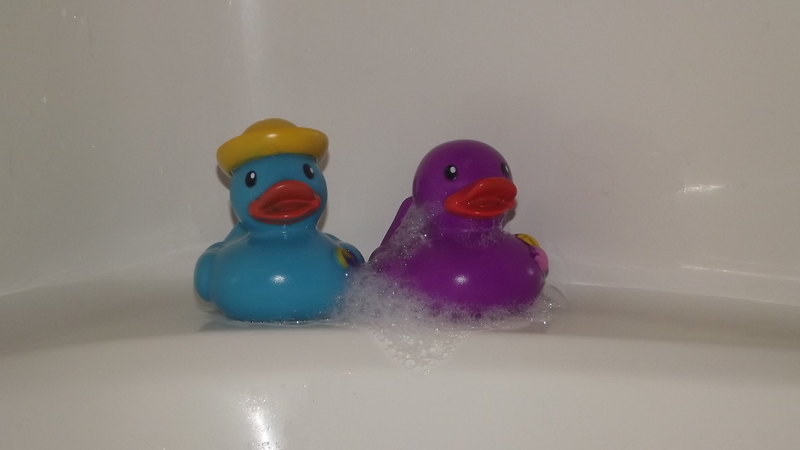 Some of my favorite blog posts from my personal blog are ones that recount conversations that I have had had with my children either while they are in the bathtub or while they are hanging over the edge of my bathtub while I try to bathe. We have many deep conversations, and some frivolous ones as well, about life, friends, home, food, faith, and any other topic you can imagine. Probably the ones that make me laugh the most are ones where I am trying to bathe and they need to be in the bathroom gawking at my every move. In honor of these conversations I entitled my new site “Tales From the Side of the Tub”. I’ve decided as my first post I would share an original post from January 28, 2006. This was titled “The Joys of Taking a Bath with Onlookers”. It still makes me laugh today just as it did over 8 years ago! You’ve never really taken a bath unless you’ve had “helpers” watching your every move while you try to relax in the tub. It’s an experience everyone should have at least once in their lifetime. I’ve started to have a flare and my joints and my legs are just killing me. They have steadily gotten worse and last night I knew by today I would be in trouble. I woke up throughout the night about every 30 minutes in pain. I decided as soon as I got up in the morning I would soak in a hot bath to see if that could bring any relief. Unfortunately 3 of the girls were up before I was able to get in the tub. Because the pain was excruciating I decided that it would be better to soak with onlookers than to endure the pain while they jumped on our bed watching cartoons. I started the water, as hot as I could stand it, got naked and jumped in the tub. My three littlest monkeys immediately were at the side of the tub gawking and dipping their fingers into the scalding water. “Why do you want the water so hot?” Emma,5, asked. “It helps to loosen my joints and muscles when they hurt so bad” I replied. “Are you just going to sit there and do nothing?” she asked again. “Yep, pretty much.” I answered. “Mama, is your baby in there?” Emma asked pointing to my belly. “Yes, he’s in there and he’s kicking around some right now.” I answered her. “What are you talking about?” I asked wondering if she meant previous stretch marks. Now, while she wasn’t right that the bruise marked the spot where the baby was she was right by chance that the baby actually was laying right there. I told her she was right and that she was very smart to have noticed that. We were in the bathroom for quite some time, Anna, 1 1/2, attempting to get in the tub, Emma wanting to rub my leg with a washcloth and Bella, 3, getting a cup to pour water on me. The door opened and we were joined by my 4th onlooker, Savannah, age 7. “I’m taking a bath because I hurt and no the girls are not getting in here with me and no I didn’t go anywhere, Daddy was just teasing you.” I answered. “So, are you having lots of fun in your bath?” she asked innocently. “Um, sure.” was the best I could come up with. “Well, I don’t want that. It’s weird.” She said defiantly. “You’re not going to have a choice, if you want to grow up you are going to grow hair.” I answered. “Even under my arms? That’s so gross.” She looked disgusted. “Can we talk about something else?” I asked. All four of them were perched on the edge of the tub, dipping fingers in the tub, flicking each other with water and watching my every move. “So why do you all want to be in here watching me take a bath?” I asked them. “It’s fun to sit and talk,” Savannah answered. “Plus it’s fun to see you naked!” Emma said with a huge smile on her face. “That’s so nice” I responded. So I realized that while they like to be in my presence I am also like side show at the circus. Come one! Come all! Watch the pregnant mommy take a bath! Only 2 tickets to watch! It’s definitely worth the price of two tickets!